DO YOU KNOW HOW TO SURVIVE IN THE BACKCOUNTRY, DURING THE WINTER, AFTER DARK? THESE EMERGENCY OUTDOOR TECHNIQUES WILL HELP YOU STAY ALIVE UNTIL RESCUE ARRIVES. Winter is when the training wheels come off for hikers, climbers, and backcountry skiers. Cold temperatures can quickly lead to hypothermia or frostbite if you’re immobilized or lying on the cold ground, the wind poses a much greater danger if you’re in an exposed location, and water is harder to find because it’s likely frozen. Survival situations, unfortunately, become all too common in the winter. You’re in a survival situation when there is a real threat to your life and a better than even chance that you’re not going to make it out alive. Think about it: What would you do if your partner hit their head on a tree skiing down a backcountry route or a big chunk of falling ice takes out your belayer? Would you keep your cool if you fell through an ice ledge on a river or if a whiteout smothers the peak you’re climbing? When circumstances spiral out of control, keeping the following pointers in mind can help you stay calm and survive. Your first priority in winter is to build a shelter to place a barrier between yourself and the elements, because the cold and the wind can cause hypothermia and frostbite. If you’re in the open and everyone in your group is mobile, you need to get below the treeline. Studies of winter accident reports have shown that people who get below treeline survive far more often than those that don’t. The trees will protect you from the wind and provide fuel for making a fire. You can build a shelter using any available materials, such as large sticks, leaves, grass, moss, and rocks. If you’re cold or wet, building a fire will significantly improve your chances of surviving. 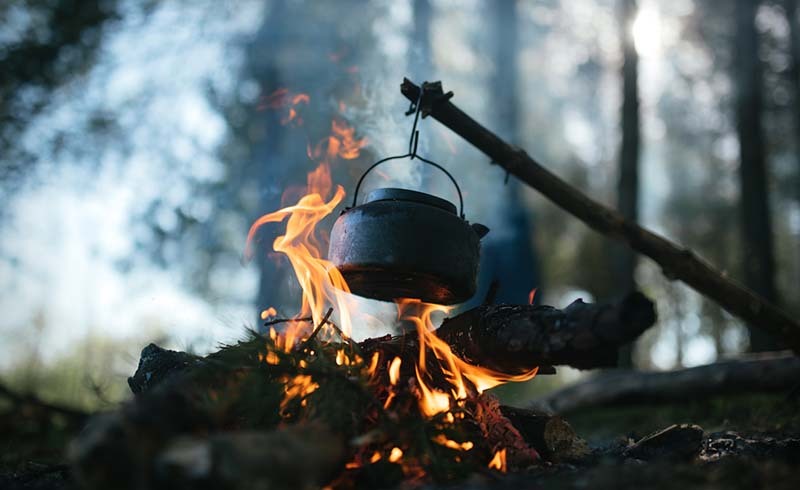 While a stove is good for making hot drinks or melting snow, it can’t help you dry wet clothing or help keep you warm for long. The smoke from the fire can also be used to alert rescuers and help them locate you. But building a fire in winter is much more difficult than building one during the rest of the year, especially if the ground is covered with snow and the dead wood in the forest is wet. You also need to bring fire starters with you such as egg carton squares dipped in wax or cotton balls coated with petroleum jelly. You’ll have a hard time starting a fire in winter without these. 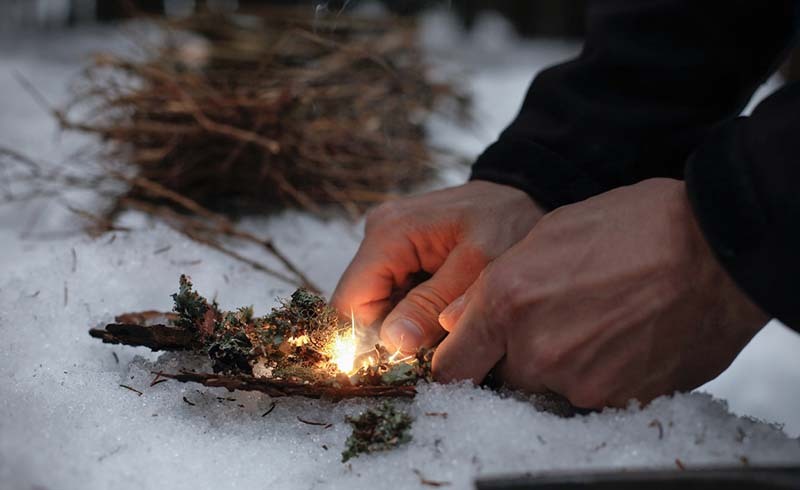 A winter survival fire doesn’t have to be big. In fact, you want to keep it fairly small to stretch your wood as long as possible. If you have to build a fire on snow, dig a pit into the snow about two-feet deep and line the bottom with thick logs cut to the same length. These will provide a solid surface for the fire. You’ll need to collect tinder to start your fire, which can be broken off the lower trunks of living trees in an emergency. Focus on building a deep bed of hot coals first, and then add larger pieces of wood to the fire. Any larger pieces of wood you gather from the ground will probably be wet. Consider adding a lightweight chain or pruning saw to your emergency gear kit so you can cut and process larger branches from downed trees and add them to your fire more easily. If the wood is wet, you can split it using a pruning saw and make smaller kindling with a good knife. Building a log cabin or pyramid-style fire will let the wood that's higher up dry while the wood below it burns. If a member of your group is injured, you need to stabilize his or her condition until help can arrive. After securing the scene of the accident to make sure there is no further danger and moving the victim to a safer location, get the injured person onto an insulating sleeping pad as quickly as possible to prevent hypothermia from contact with the cold ground. Your immediate focus should be on stabilizing the person's condition, immobilizing the person so he doesn't harm himself further, and keeping him warm, since rescues take much longer in winter than the rest of the year. Store a first aid kit in a packing cube so it's easy to access during an emergency. Also: Look for a first aid and CPR course near you through the American Heart Association's website to make sure that you're certified. It’s important to stay hydrated in winter, especially in a survival situation, because it's a defense against hypothermia and frostbite. If you’re out of water and you're not near a freely running water source, you will have to melt snow for drinking water. If you don’t have a stove or cook pot to melt snow, put snow in a water bottle and place it in your coat to melt it. Don’t do this, however, until you have a fire going and can stay warm. It can take rescuers some time to get to you—possibly days—and having water and fire will help keep you alive, even if you’ve run out of food. If you prepared for your trip properly, you left a trip plan with a trusted relative or friend who will call Search and Rescue (SAR) if and when you’re overdue. Be aware, though, that many SAR teams won’t start searching for you or launch a rescue (even if they have an exact fix on your position) until daylight or until a bad weather event has passed. If no one knows that you’re missing, you’re going to have to signal for help. Putting green wood or leaves on a hot fire will generate smoke that rescuers can see. Circumstances will vary widely by locale, so you’ll probably want to bring extra communications gear, like a personal locator beacon, to signal for SAR assistance if you’re in remote backcountry or experiencing a bad weather event. You can’t always count on electronics in winter, but they’re a worthwhile investment. Don't just write down these skills. My advice: Practice them until you master them, so you won't even have to think about what steps to take if and when an emergency strikes. When you're prepared for the worst, you'll have a lot more peace of mind while hiking, climbing, and skiing each winter.